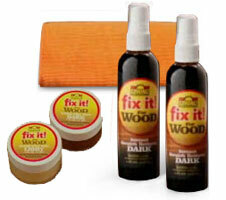 Right now you can order Fix It Wood for just $19.95 plus shipping and handling. Plus you’ll also receive a Flexible Duster free with your order. Just pay additional processing. 7 Comments on "Fix It Wood"
How much is the content of each bottle? How much is the content of eaghcan? How can I get number to order Fix It Wood? Need it badly. AND do you have a product I can put posters, etc on wall (like a putty-type) so I don’t have to use nails? THANKS! Gloria in Brooklyn. how do i order for canada? unable to order on your site! Is this sold in stores in Long Island NY?